I'm not the first to say it, but it really is time to defeat that tired old belief that you should only serve white wine with fish. 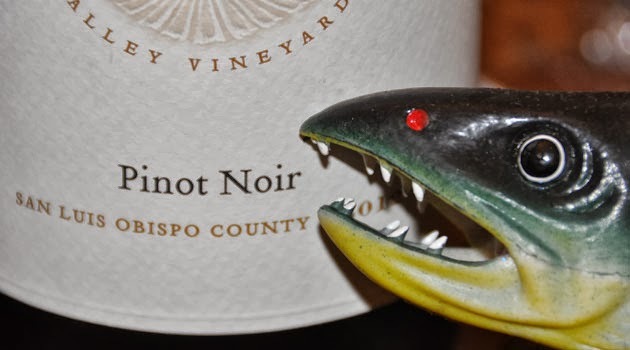 Pinot noir, a red, can have a subtlety that plays well with seafood, especially if you opt to play up some pinot flavors in your fish dish. For instance, often people note a mushroom essence in pinot -- so if you cook with some mushrooms, that will help your dish and your wine work well together. Note: you don't have to pair wines with food so they harmonize; sometimes it's good to have different songs singing at your table for a fuller chorus of flavor. That said, pinot and mushrooms are a match made in culinary heaven.